Notice: This product was discontinued on Sep 29, 2013. The TA720 Time Interval Analyzer has larger memory capacity and is faster than the highly regarded TA520 and TA320. It has a maximum sampling rate of 80 MS/s, and maximum memory capacity of 1024 k samples (in Time stamp mode). 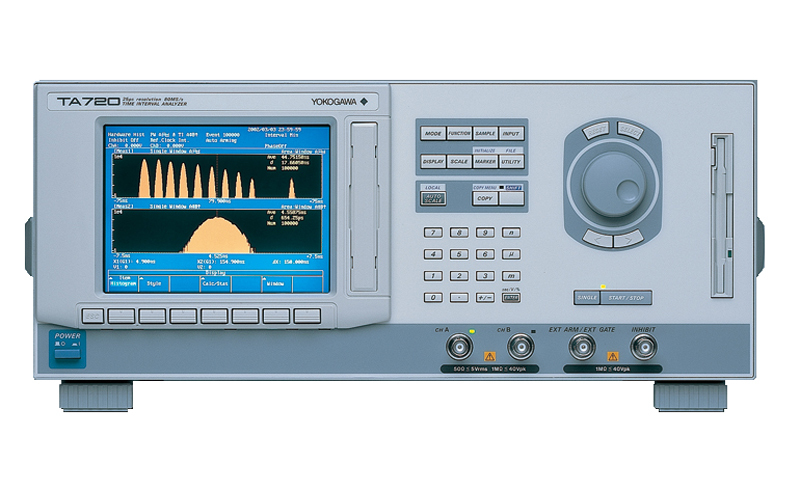 In addition, the TA720 has a variety of completely new functions, such as a dual measurement function, inter-symbol interference analysis function, and an optional Ethernet and PC card interface. 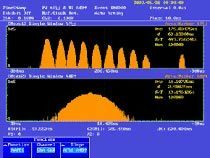 This time interval analyzer is the ideal analysis tool for jitter analysis of high-speed optical disk signals and recording characteristic evaluations. The TA720 can continuously measure signals as fast as eight times DVD speed. It continuously measures high-speed signals from sources such as fast-rotating CDs and DVDs, and next-generation optical disks without dropping measurements. This makes accurate jitter analysis possible. This function enables two measurements to be done simultaneously. The available measurement combinations are Period A & Period B, Period A & A-to-B time interval, Pulse A & Pulse B, and Pulse A & A-to-B time interval. During optical disk jitter measurement, for example, it is possible to perform two types of jitter measurements (data-data jitter and data-clock jitter). With this function, it is possible to extract and analyze data corresponding to set code conditions (such as all T spaces between 3T marks). The distribution of the extracted data and related statistics can also be displayed and compared against all of the data at the same time. When combined with the dual measurement function, the inter-symbol interference analysis function enables even faster jitter analysis through techniques such as extracting data-clock data using pulse width as a condition. Data transmitted to the TA720 through an Ethernet connection can be saved to the PC card or shared over a network. In addition, measurement conditions can be set and controls such as starting and stopping measurements can be entered over the network when an Ethernet connection is used. The TA720 has a variety of functions that are useful in optical disk jitter measurements. These functions can be combined for even greater efficiency in jitter measurements. The dual measurement function can be used to simultaneously measure an optical disk's data-data jitter and data-clock jitter. In the past, it was necessary to do these measurements separately, so there was a need for steps such as synchronization using an index signal from a spindle motor as a measurement-start control signal. With the TA720, however, these two measurements can be done simultaneously, so data-data jitter and data-clock jitter from the same measurement area are obtained at the same time. Example of simultaneous measurement of pulse width and data-clock jitter. This function extracts data corresponding to specified conditions, such as jitter for each space length immediately following a 3T mark, and jitter in each space length between one 3T mark and another. This data can be used to analyze the effects of the code on jitter. 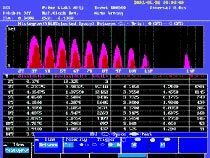 The inter-symbol interference analysis function is useful for evaluating recording strategies, such as recording power control and phase control, and recording waveforms. The distribution of the extracted data and related statistics can also be displayed and compared against all of the data at the same time. The inter-symbol interference analysis function can be used in combination with the dual measurement function (Pulse A & A-to-B time interval) to extract data-clock time difference data at each recording length (pulse width). The TA720 can simultaneously display histograms and statistics for both the positive and negative pulse widths. Numerical individual jitter values, distributions (difference between average value and ideal value for each pulse width), and the like can be checked while comparing the positive and negative histograms. In addition, it is possible to display bipolar histograms and statistics. This function allows you preset up to 14 windows for simultaneous analysis and display of histograms and statistics in those windows. During dual measurement function, data-data and data-clock histograms and statistics can be displayed at the same time. In cases where the CAV control is used and the data rate changes according to disk position, the auto-window function is useful for automatically adjusting the window setting. This function provides an Estimated T method, in which the clock period is estimated from the average data signal value; and a Measured T method, in which the clock period is measured from the CHB input signal. The clock period is measured to automatically adjust the window position. The inhibit and external arming functions can be used to separate the data part from the header part during jitter measurement. In addition, a block sampling function can be used to divide the internal memory into as many as 1000 blocks (250 blocks during time stamp mode) for data acquisition. In cases where the recording area is small, such as during media material evaluations, the block sampling function can be used to accumulate samples by performing multiple block measurements with a small amount of data in each measurement (block). widths are displayed at the same time. trends for two measurement functions. nT on an optical disk. The Ethernet and PC card interface let you access the TA720 from a PC through a LAN in order to download data from the TA720's floppy drive or PC card. You can also transfer waveform data and screenshots from the TA720 to the PC for saving. You can save, delete, and copy waveform data and settings on storage media such as the internal floppy drive or a hard drive located on a networked PC or workstation. These operations work the same way as when you handle data on the PC card. In addition, screenshot data can also be saved. The TA720's FTP client function can be used to save, delete, and copy waveform data and settings on PCs and workstations running the FTP server function. You can download files from the TA720's internal floppy drive or PC card to a networked PC or workstation. The TA720's FTP server function can be used by PCs and workstations running the FTP client function. A PC can be used to set measurement conditions on the TA720 and control when measurement starts and stops. The TA720's Ethernet connector is a 10BASE-T connector. Connect it to your network through a hub or router as shown.